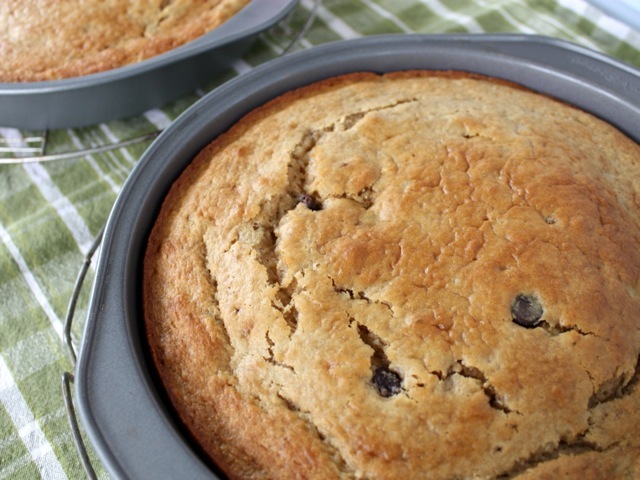 This cake is exactly what it sounds like: banana bread baked in a round pan instead of a loaf pan. The technique solves one of the fundamental challenges of loaf quick breads: the dreaded burnt-around-the-edges, raw-batter-still-in-the-middle problem. It also bakes more quickly, and turns out a lighter, moister treat. Preheat the oven to 350 degrees. Grease two 9-inch round cake pans and line their bottoms with circles of parchment paper (you can buy these in stores ready-cut). In a large bowl, whisk together the flours, brown sugar, baking powder, baking soda, and salt. In a large measuring cup, mix together the buttermilk, oil, vanilla, and eggs. Add the wet ingredients to the dry and mix thoroughly. Add the bananas and mix just until combined. Stir in the chocolate chips, if using. Divide the batter between the pans and bake for 25 to 30 minutes, rotating halfway through. Remove when the edges are lightly browned, the tops have just cracked, and a toothpick inserted into the center of a cake comes out clean. Cool on a rack for 10 minutes. Run a knife around the edges of each cake and invert them onto a rack and then back on to a second rack or serving plate to finish cooling. Serve when still warm (especially if you used chocolate chips, which will still be melty) or at room temperature, cut into slices. These cakes keeps very well, covered, for three days. You can eat these cakes perfectly plain, of course, but if you wish to stack them in a traditional two-layer cake, fill and frost the tops and sides with cream-cheese frosting, chocolate ganache, or any other thick-but-spreadable icing of your choice.